Felix is the industry standard software program for off-line data processing, spectral visualization and analysis of high resolution, one- to four-dimensional, homonuclear and heteronuclear NMR data. It is available as a workstation product that runs on Linux or SGI and as a desktop product for Windows PCs. Felix NMR, Inc. specializes in NMR processing and analysis software and is committed to the continued development of Felix. 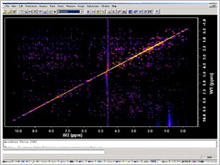 transferred to Felix NMR, Inc.
• Flexible visualization of spectra. • 'E-Z' macros that allow you to quickly process all spectra from one to four dimensions. • 'E-Z' macros that allow you to flexibly incorporate a range of processing features. • Flexibility to customize all your macros. picking and other spectral information.